San Roque de Cumbaza, Perú. 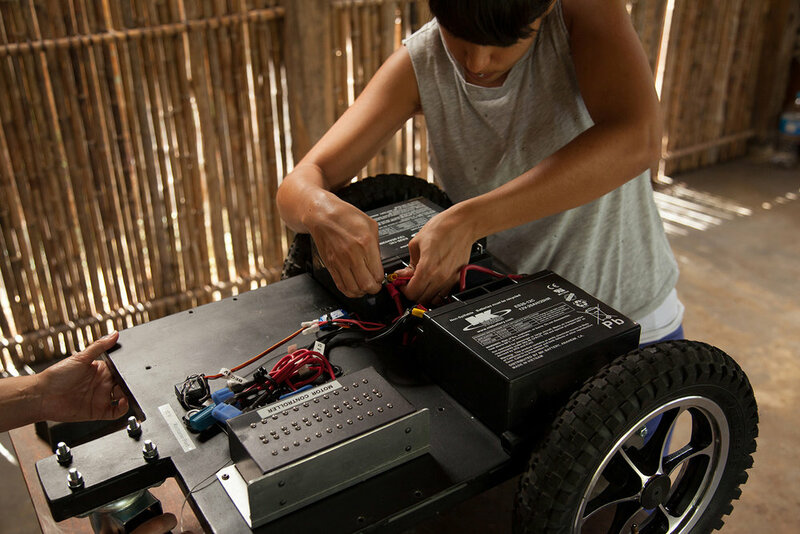 This first mestizo robot was built in a small village in the Peruvian Amazonia with the help of local assistants. It consisted of a 48-inch diameter covered mud sphere with an internal mobile mechanism. A series of layered systems define the structure: an interior laser-cut transparent polycarbonate truncated icosahedron; a spherical circle-covering armature made of an indigenous flexible wood (angarilla); and an exterior quincha plaster (mud and thick grass) shell. Enclosed inside the sphere runs a three-wheeled mobile robot programed with an unpredictable behavior that alters the sphere’s balance and makes it wobble. TZ'IJK.0. Early drawings of geodesia structure and the internal robotic device. TZ'IJK.0. Local builderAdriel Vasquez Saavedra plastering external quincha layer. TZ'IJK.0. Local school children interacting with the robot in San Roque's main plaza. Residency at Sachaqa Art Center, San Roque de Cumbaza, Perú. Funded by Fundación Telefónica VIDA 14.0: International Competition in Art and Artificial Life, 2012. TZ'IJK.0. Geodesic structure completed with internal mechanism, ready to be plastered with quincha paste. TZ'IJK.0. Collecting angarilla wood in the rainforest to build the geodesia structure. TZ'IJK.0. Assembling the robotic internal mechanism. TZ'IJK.0. The QuinchaBot prototype recently plastered with mud.